There has never been a bun created that can handle a juicy burger, even my homemade ones fall apart . . . that is until I discovered this incredible recipe . . . soft, delicate crumb on the inside . . . golden, chewy and salty on the outside! I am talking about the Pretzel Roll . . . seems I'm the only one who's never heard about these delicious rolls . . . that is, until now! Where have you been all my life?!!! They take a little extra time to make but are well worth it! If you follow my recipe using your bread machine, there's no mess in the actual making of the dough and the first rise, which will cut out kneading, cleaning a food processor ( my least favorite job) , or mixing bowl, paddle and then greasing said mixing bowl. That will save you a good 15 minutes! This recipe makes 8 very large hamburg or sandwich rolls or 16 small rolls. 2 1/4 teaspoons saf instant yeast (saf yeast may be purchased at Smart and Final, WinCo and on the Internet). In bread machine pan~ Add water, butter, salt, sugar, and flours; make a shallow well in the center of flour and add the yeast. When DOUGH cycle is finished, gently punch down dough. 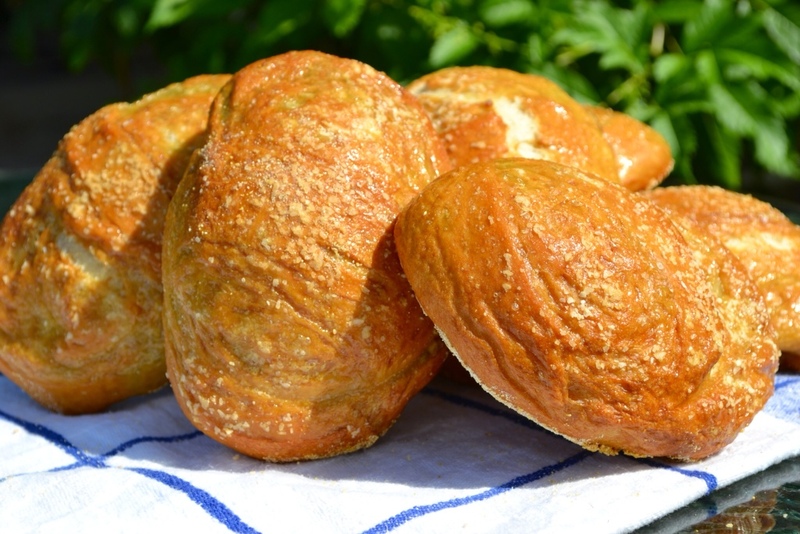 For 8 rolls, divide dough into 8 even pieces (8 rolls- 4.5 ounces each / 16 rolls- 2.25 ounces each). Form balls by tucking and stretching the dough under to form a neat ball. Flatten dough balls slightly and place on parchment-lined baking sheet; cover with tea towel and keep in a warm spot to rise until double, about 1 hour (I use my microwave to provide a warm, draft-free environment, closing the door to just before it clicks shut). Meanwhile, adjust oven rack to center of oven; Preheat oven to 375F. Prepare a second parchment-lined baking sheet sprinkled with cornmeal. In a Dutch oven, heat 8 cups of water to boiling, add baking soda and sugar, it will foam up a bit, hence the Dutch oven. Add risen rolls to boiling water-bath 3 at time; poach 30-seconds on each side turning with a skimmer or large slotted spoon. Place poached rolls on 2nd baking sheet with cornmeal. Apply egg wash, coarse salt. Snip an X 1/4-inch deep in the center of each roll with sharp scissors or slash rolls with a sharp knife. Bake for 23-25 minutes, less for smaller rolls. 1. Poached. 2. Egg washed and salted. 3. Baked to perfection! 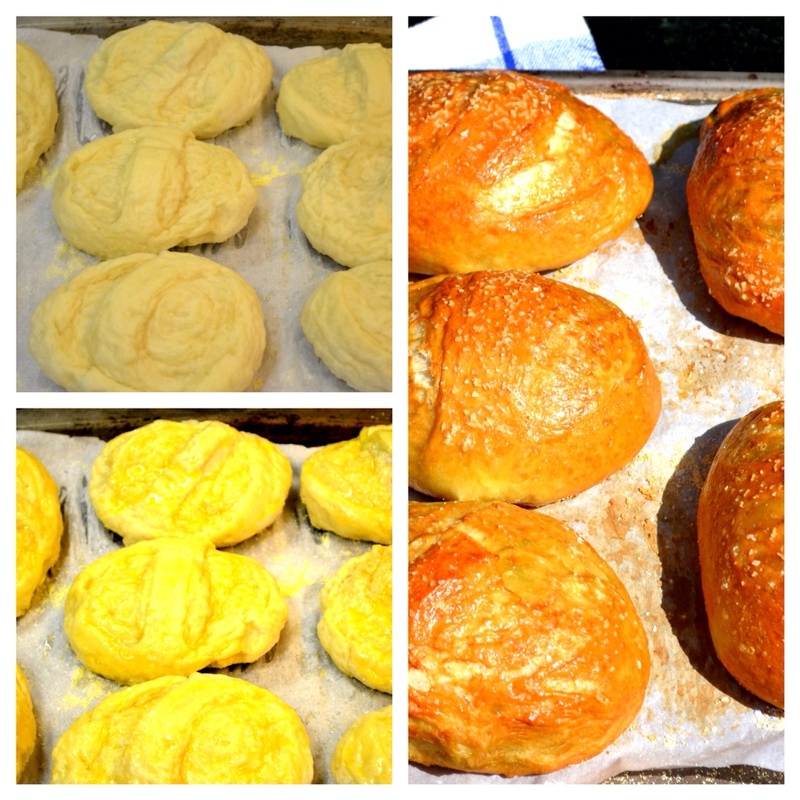 As you can see from my photos, I slashed my rolls before the second rise. They turned out beautifully, but the contrast would have been greater if I had waited until they were poached, egg washed and salted before I slashed them . . . I did the same thing recently with the Kaiser Rolls I made. Guess I enjoy that slashing part a little too much, and jumped the gun! 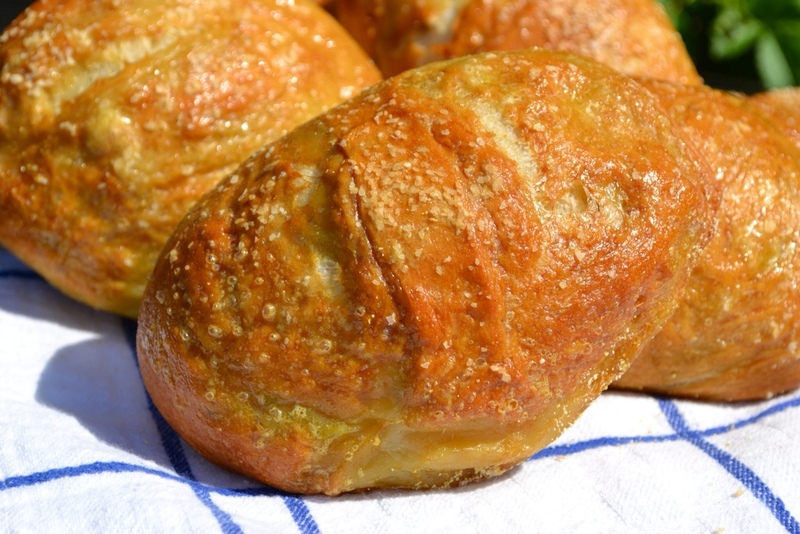 These Pretzel Rolls are truly a thing of beauty! There it is, in all it's glory! The Ultimate Hamburger! 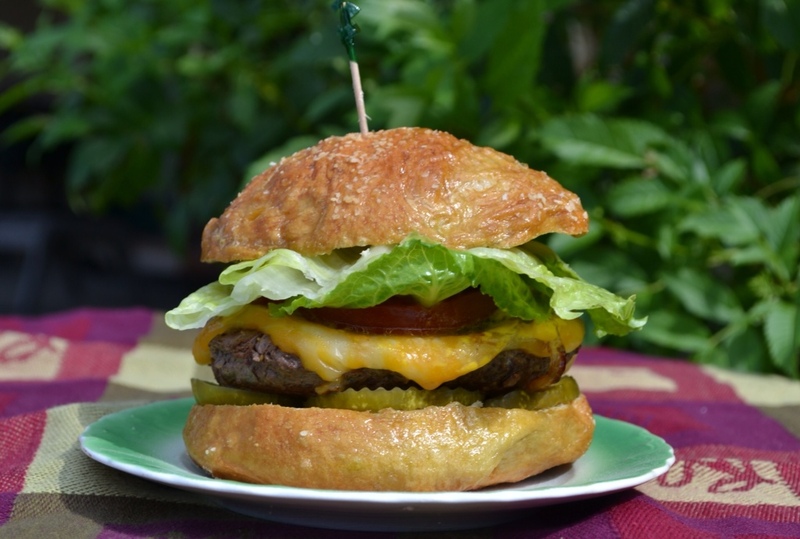 Will and I thoroughly enjoyed our juicy burgers with these Pretzel Rolls . . . the coarse salt adds that extra flavor to every bite and they didn't fall apart! 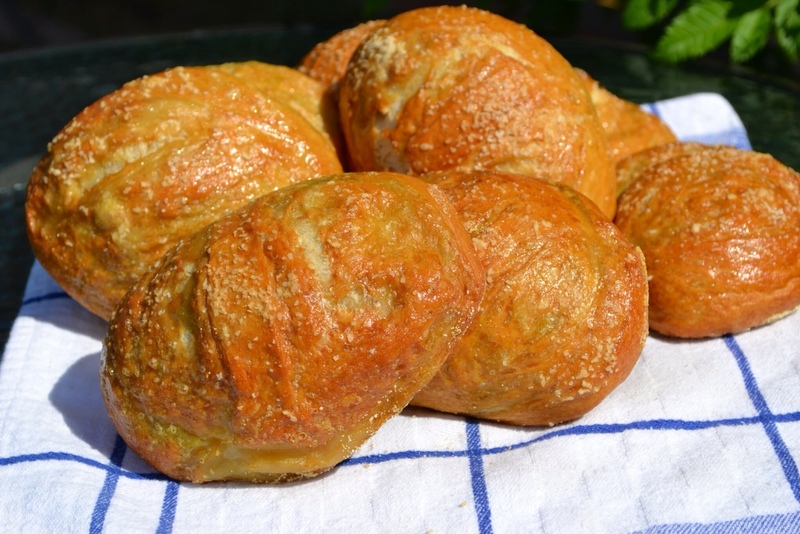 Today we enjoyed honey-ham, mustard, cheese and lettuce nestled between those delectable pretzel roll halves for lunch! I think it's the salty-chewiness on the outside that leaves you feeling so satisfied. It's 10:30pm here and the temperature is already down to 71 degrees! Great sleepin' weather . . . Over at Julie's!!! Recipe adapted from Bon Appetit January, 1994 and Tasty Kitchen.